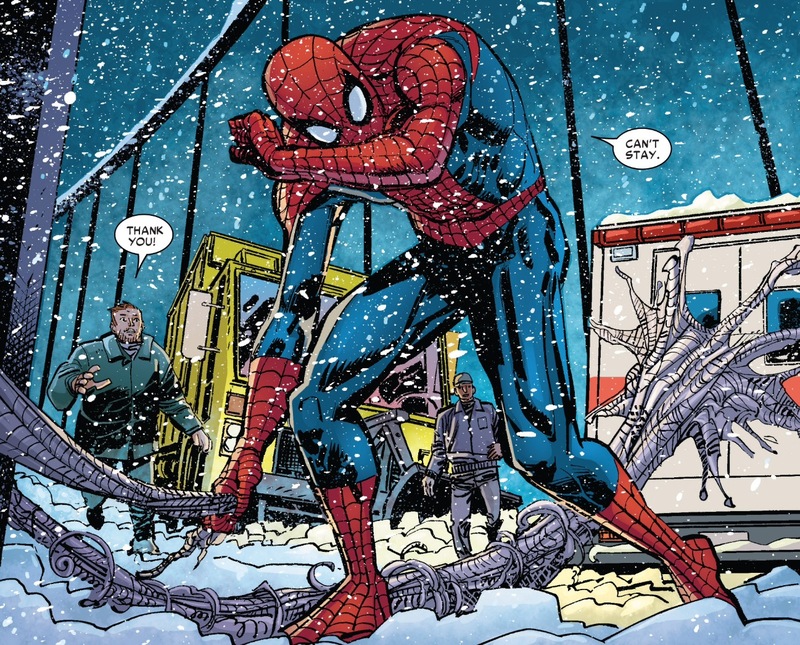 Amazing Spider-Man #700.2 and Meeting Expectations? Home » New Issues » Amazing Spider-Man #700.2 and Meeting Expectations? The bar was set so high after the first half of David Morrell and Klaus Janson’s “Spider-Man: Frost” story (better known via Marvel’s innocuous numbering system as Amazing Spider-Man #700.1) that one might have assumed a letdown was inevitable. 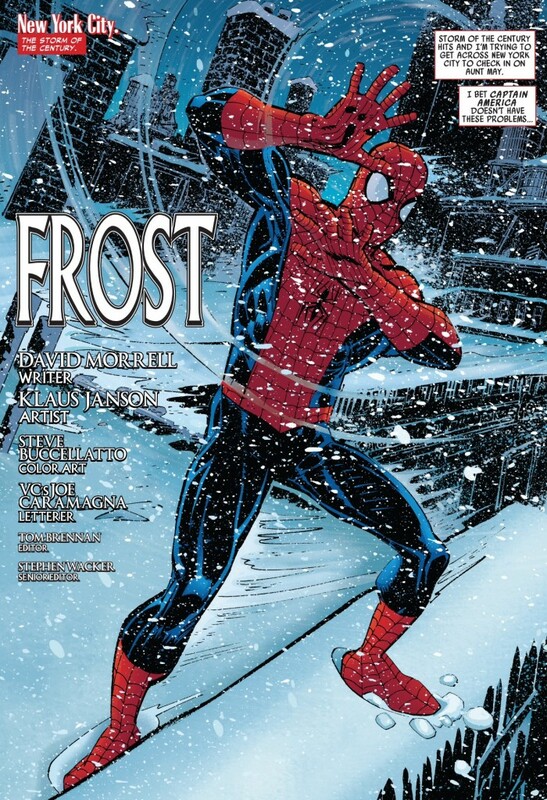 It was probably incredibly premature and presumptuous for me to mention “Frost” alongside some all-time great Spidey stories like J.M. DeMatteis’ heart-wrenching classic, “The Gift,” especially since Morrell is a relative newcomer to the comic book medium (despite being a literary great who’s also written for movies). But part of the reason I heaped such lavish praise on “Frost” part one was my assumption that Morrell and Janson had hit upon a bulletproof formula that would easily carry over to the story’s second half. Part one captured the classic Spider-Man theme of his ongoing struggle between great power and his great responsibility, while also featuring some astonishingly well-written prose from Morrell (especially by comic book standards), and artwork from Janson that felt emotionally invested in the story. What could possibly go wrong? Unfortunately, something did go wrong, or at least, some things didn’t go right enough where it’s hard to not feel a bit disappointed by “Frost’s” conclusion. As many of you may know, Morrell said on his Facebook page on Wednesday morning (the day the comic was released) that a “terrible version” of his story had been published by Marvel. Apparently, the wrong – unedited – version of his story went to the printer. It’s flaws, per Morrell included “weak jokes,” repetitive captions and deleted captions. In an e-mail Morrell sent me Wednesday morning, he reiterated his disappointment with ASM #700.2, and included a list of the edits he had suggested that we obviously didn’t get to see in the printed comic, though it sounds like an updated version of his script will be available when Marvel republishes “Frost” as part of a trade paperback. As for how “terrible” the published version of ASM#700.2 turned out to be, there were obviously a handful of errors and typos that justifiably upset Morrell, but to play devil’s advocate here, some of the changes were not as abhorrent as he was making them out to be (despite the fact that it’s clearly not the version of the story he wanted to see published). In terms of truly unfortunate mistakes, the title page features an ugly typo (“contenter” is printed rather than “contender”). On the first two pages of the actual story, “Storm of the century” and “can’t feel my face” are each used twice. Just like newspapers and books, the comic book world is chock full of typos (Peter Palmer anyone? 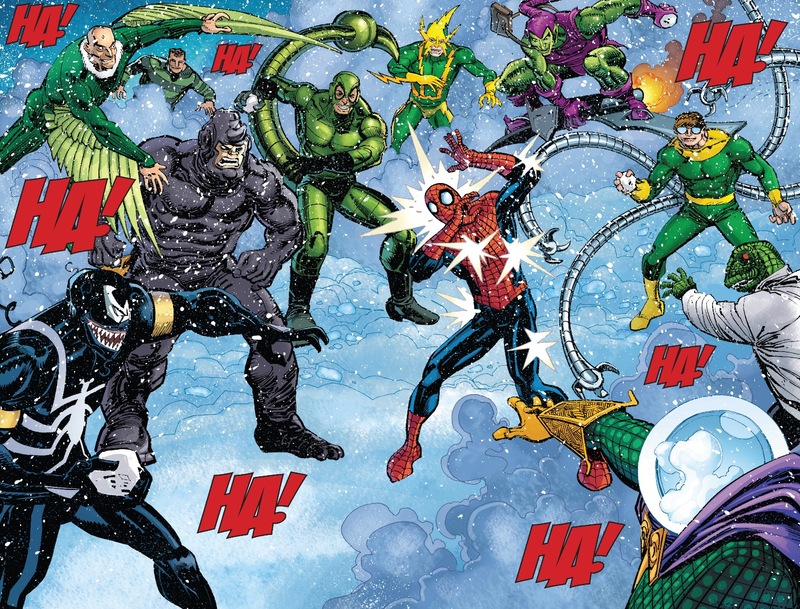 ), but to find three obvious ones of the first three pages of ASM #700.2 is such a discouraging way to kick off any story, especially with one that had lofty expectations placed upon it. At the same time, I know that Morrell was upset with Spider-Man’s Captain America joke on the story’s first page, as he thought it was a tonal clash with the pacing and mood he established in the first part of “Frost.” It’s a classic Spider-Man joke that’s been used all the way back to the Silver Age of comics: I bet (insert Marvel hero’s name) doesn’t have to (insert random problem Spider-Man has to deal with because of his historic unluckiness). I ultimately agree that it’s a bit out of place in “Frost,” but I can see the logic in someone on the editorial side attempting to add bit of levity to this otherwise very serious and somber script. While there’s a bit of melancholic tragedy to the Spider-Man character, I think there are some writers out there, especially those in Hollywood, who tend to forget that he’s also quite funny. From my perspective, I wasn’t as taken out of the moment by the Captain America joke as I think Morrell thought some people would be when he first read it and asked for it to be removed. Further into the comic we have an interesting instance where an error may have indirectly changed the entire theme of the story. 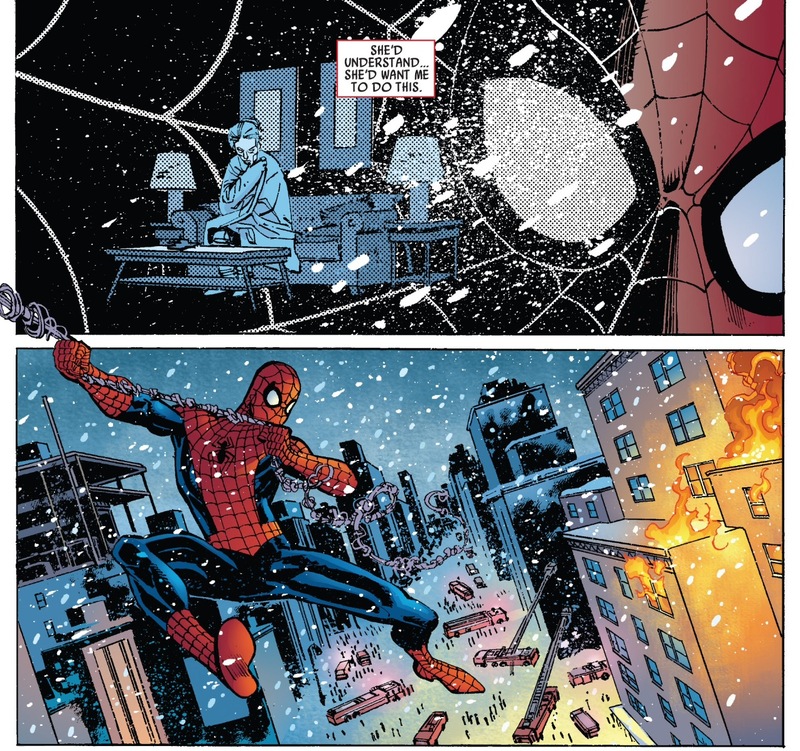 As Spider-Man is making his way over to Aunt May’s, he sees a building burning. He tries to ignore the fire in order to stay focused on rescuing May, but his obligation to responsibility wins out and he stops. The line during this sequence that Morrell questions is “she’d understand … she’d want me to do this,” referring to Peter dealing with the fire, rather than going directly to his aunt’s house. Given the fact that Morrell is very clearly trying to establish a “life or death” choice for Peter to make involving the one person he loves more than anyone else, this piece of narration does come across as a tonal U-turn. Having Peter justify his decision by believing Aunt May would understand robs the scene of all of its drama and potential tragedy. Peter is choosing the lives of strangers over May. This needs to feel like one of the hardest, most agonizing decisions Peter has ever made, and instead it reads very flippantly because of that one little change in the script. Despite these hiccups, I do believe that ASM #700.2 sticks the landing and hits many of the emotional beats in the comic’s second half that Morrell and Janson were going for. The scene where Spider-Man falls prey to exhaustion and despair and has a dream sequence of sorts, seeing some some of his most nefarious villains surrounding him before Uncle Ben shows up and leads him the rest of the way to May’s house, is especially powerful. Having May turn around and tell Peter to “slow down” at the end of the issue, was equally poignant, and a nice tip of the hat from Morrell and Janson to the pacing and quietness of the storyís first part. 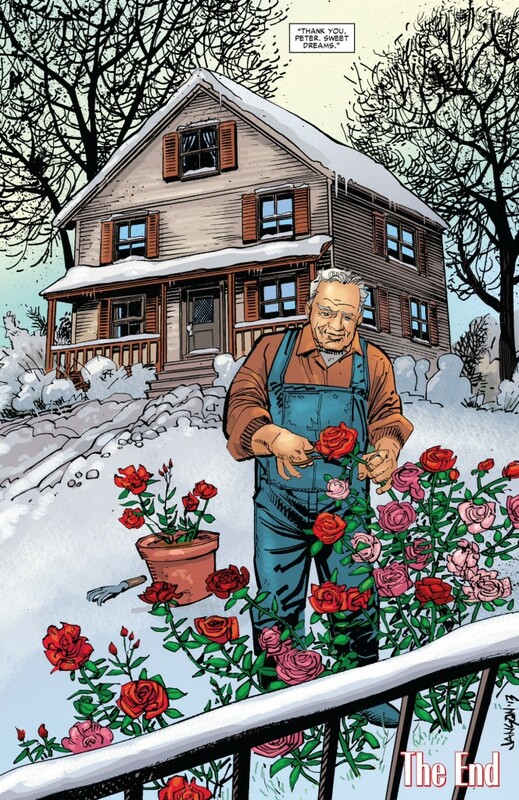 And of course, seeing a proud Uncle Ben at the end, working in the garden, is the ultimate tear-inducing moment for anyone who loves the Parker family as much as they love Spider-Man. When viewed as a complete story, I’ll admit it’s a bit difficult for me to judge “Frost” without taking into consideration some of the behind the scenes issues that both upset Morrell and hampered the finished project. 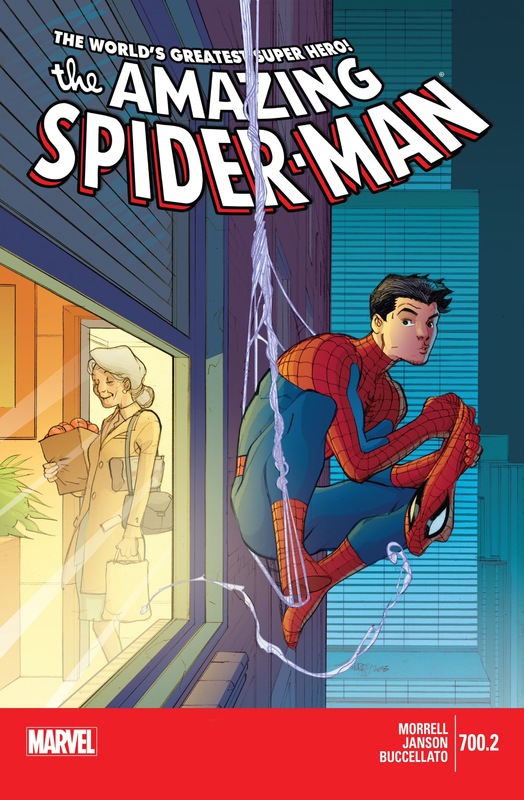 I still maintain that this was a wonderful story to bring the “mainstream” version of Peter Parker (dubbed our “mom and dad’s” Peter by Stephen Wacker) back to our collective consciousness, especially with the solicitations for Superior Spider-Man making it sound more and more likely each time out that the old status quo is close to returning. I’m sure Morrell is disheartened by what happened, but in my book he’s still welcomed to write a Peter Parker comic again any time he’s willing or able. I think the fact that he doesn’t have a ton of experience working with Spider-Man, or the comic book medium as a whole, brings a certain freshness to his voice, and I appreciate the obvious love and care he puts into his prose. I firmly believe that comic books are as much a written art form as a visual one, and Morrell’s style certainly gives credence to my argument.